The Chakra project started out releasing a live CD based on Arch Linux with KDE 4 for the desktop, initially to make it easier and quicker to install an Arch system with their favorite environment, while also providing an unofficial Arch live CD to test drive the distribution. It is in their own words for anyone who likes the KISS principle of Arch and the elegance of KDE and the Plasma desktop. The project is providing images for both the i686 and x86_64 architectures. They currently have new betas of their upcoming release 0.3 'Ashoc' out. For anybody who would like to test themselves, they can find the images here for download. Btw, this is the same team that previously was responsible for KDEmod for Arch Linux, a modification aimed at breaking down and optimising the KDE distribution and its meta-packages into its smaller programs to allow for more fine grained installation. It looks though as if KDEmod is now set to be discontinued, focusing all time and energy on the Chakra GNU/Linux distribution. 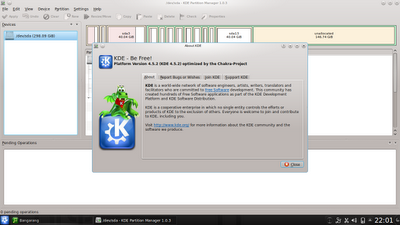 Chakra continues to provide a tweaked and modular KDE that is optimised for this distribution. I opted to download the ISO optimised for i686 at a size of just over 700MB which allows it to fit on one CD and then tested Chakra in Live mode, in Virtualbox and from a full hard drive installation. I had also intended to test the x86_64 version but decided to abandon this after poor download speeds. It should not make a difference in the desktop experience after all if not benchmarking for performance. Only bear in mind that the flash plugin will not be available for 64 bit. The current beta comes with kernel-2.6.36 with LZMA support, KDE SC 4.5.2 and Xorg 1.9.1. As other reviewers have already commented, the artwork is quite beautiful, although of course one can argue about that. The Chakra team have designed their own boot splash and KDM login theme that tie in with the overall desktop look and feel afterwards. The Chakra KDE theme is called NEDA and seems to be a darkened smoky variant of the Air theme, although when looking at the panel it could be mistaken for Oxygen at first. These are the only desktop themes available. Apart from the default wallpaper and login theme of this upcoming new version there are also the standard KDE Air login theme and Ethais wallpaper and the one of the previous version, crunchy-branch-blue, to choose from. Booting up the Live CD presented several choices. The first screen allows you to choose the preferred language for your upcoming environment, then in the next screen you get to choose between booting from hard drive, booting with free drivers only or booting with non-free drivers. This way depending on your inclination and attitude towards binary blobs everybody can be happy. Nice touch, and not shutting any one group out. There's also the option to load entirely into ram. You boot into a fairly standard KDE desktop, but with access to several unique and important shortcuts in your Folder view widget. In a folder named Licenses you find access to the GPL, the license for distributing mscorefonts, wireless firmware. 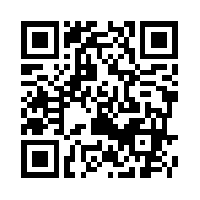 Other links lead to the Chakra project home page, to the documentation or to their forums. Another link allows you to donate some hard earned cash if you feel it's worthwhile, and from another button you can start the full installation. Last but not least, and these two are a particularly good idea, the file Installed Packages provides a list of all by default installed packages so you know what your base install comes with, and a Passwords text file that provides the necessary default passwords should you log out and then want to log back in again, or if you want to add an application to your running live session with sudo. This is very newbie friendly (in the sense of an intermediate to advanced user but new to this particular distribution), and lack of an obvious password has left many a user stumped in other distributions if they logged out by accident, leaving no other way than to reboot. More than a few times I recall desperate posts from people having been handed live CD's asking "but what's the password?". The live session ran well and was very responsive, more to the speed I would expect than some other distributions. It sort of reminded me of my review of Kongoni GNU/Linux, where I found myself surprised by the speed of a full KDE desktop running from CD. Again, top marks. Wireless however did not work in live mode, and choosing the proprietary driver for my ATI M880G (Radeon HD 4200) card still did not let me enable desktop effects. Trying Chakra in Virtualbox was a standard affair. The point was to find out if Guest additions are installed by default as this would make it a lot easier to run in full screen or seamless mode, which is really required when running in resolutions monitors offer today. 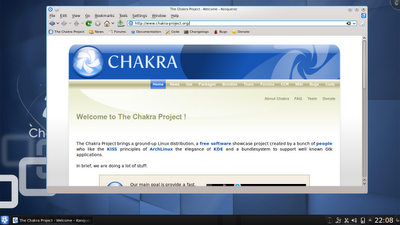 Unfortunately, the additions are not installed, making it a bit more work to get your Chakra going in Virtualbox. Proceeding to a proper hard drive install I have to note the beautiful but at the same time no-nonsense straight forward graphical installer. 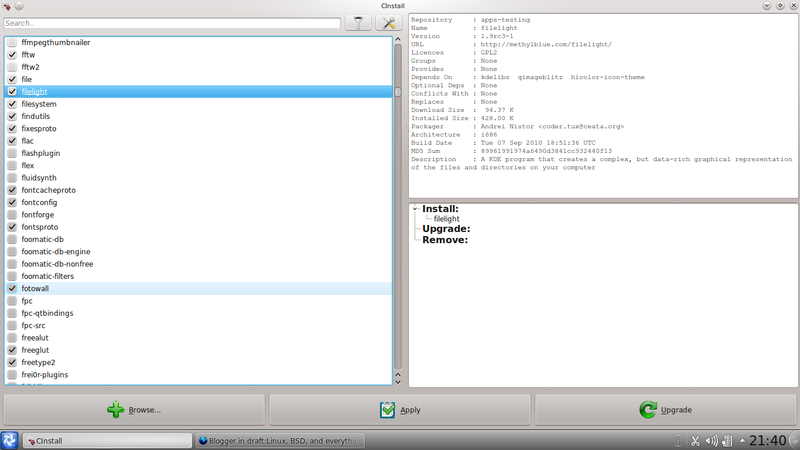 It reminded me of the Mandrake Linux installer of old, or perhaps the openSUSE installer, but more streamlined. The installer again is held in mostly dark blue and black, which seems to be the favorite theme. It's all standard steps - once you have installed with Anaconda most graphical installers seem to be a variation of it. If not, they are usually too convoluted. Having my hard drive already partitioned was a plus as there is no way to do this from within the installer, only to choose mount points and format. Auto setup and manual configuration options are there. In another step you are asked to provide the root password and create a user. Setting location and time zone you get to zoom in on a high quality map straight from an atlas. When all is done, which on my machine took an astonishing four minutes to copy the files over, time to reboot. First thing I noticed was that my Broadcom wireless was fully supported and worked, so to speak, 'out of the box' with KNetworkManager. Still not lucky with the desktop effects though. Most distributions that use KDE for their desktop come with the same set of applications these days, only varying in whether the provide OpenOffice, Koffice, or none at all by default. The rest is standard - Okular for document viewing, Gwenview for pictures, Quassel for IRC and so on. Chakra does not come with an office suite on their CD, but it makes some interesting choices in other departments besides the standard apps. For example the Utilities section includes a tool called 'luckyBackup (Backup and Sync tool)'. There is also something called 'miniBackup' that will back up your most important KDE files from your home folder. The Marble desktop globe is the only one pre-installed in the Education section. Under Graphics Chakra introduces Fotowall which impressed with a clean and slick looking interface but needs a bit of getting used to to navigate around. This photo management tool provides access to Flicker and Google's picture service Picasa (the web service). Fotowall also includes web cam support allowing you to record streams. In Multimedia we have Bangarang Media Player, which again convinced with a clean and minimal interface. 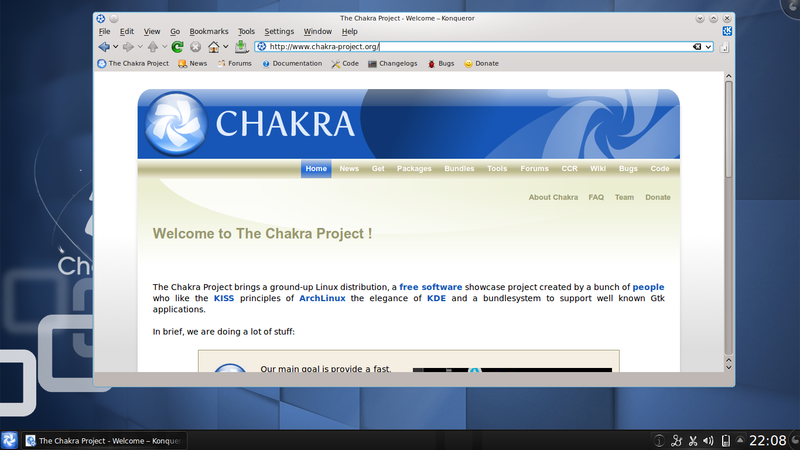 Chakra does not come with the Firefox browser, but besides Konqueror includes Arora, a browser that uses Qt and webkit as a backend. Referring to earlier reviews, Chakra has included more applications this time and is almost ready from the get go, but it does not include codecs or Macromedia flash by default. The real innovation in Chakra is when it comes to handling additional programs and libraries. First of all Chakra have introduced Cinstall as a graphical interface to pacman, the command line installer in Arch Linux. This should make it more accessible to people used to graphical package management and works as expected. It has a simple and intuitive interface outlining the installed and available packages on the left and a description on the right, nothing overcomplicated. I installed Filelight which showed up immediately in the menu. Cinstall does not allow for managing repositories graphically, which would be a nice addition. The second and probably main distinction is the Bundle Manager. Part of Chakra's philosophy is to keep the system free of the plethora of gtk-libraries and sprawling dependencies, while still providing support for some of the more widely used Gtk-applications. They achieve this by providing bundles that install as an ISO-like image into a squashed filesystem that contains all files needed to run the application. This seems, at least in the effect, vaguely similar to pbi's in PC-BSD that include statically linked dependencies, or to modules in some distributions. At present there are only 20 bundles available, among them OpenOffice and Inkscape, and Firefox, which is not available in the main repository and only via the bundles system, is under the guise of Namoroka (without the Mozilla branding) only available in version 3.6.8, which is four iterations back by now. Lastly, the Chakra team are making their Livescripts 2 available which allow for creation of your own LZMA-compressed media for smaller images (or for more to fit onto one CD) and for hardware autoconfiguration. Fonts look good throughout, with consistency over all applications. I also installed and tried Chakra with German language settings, but only KDE was actually localized and most other applications and aspects remained in English. Similarly, choosing British English did not change the keyboard map, it remained set to US. More work will be required here, either by the team or by yourself if you want to make this work for your country. However, this is the same as in Arch and Archbang and can be rectified with editing a few text files. The localization of other graphical apps is more problematic should they not be available in your language. 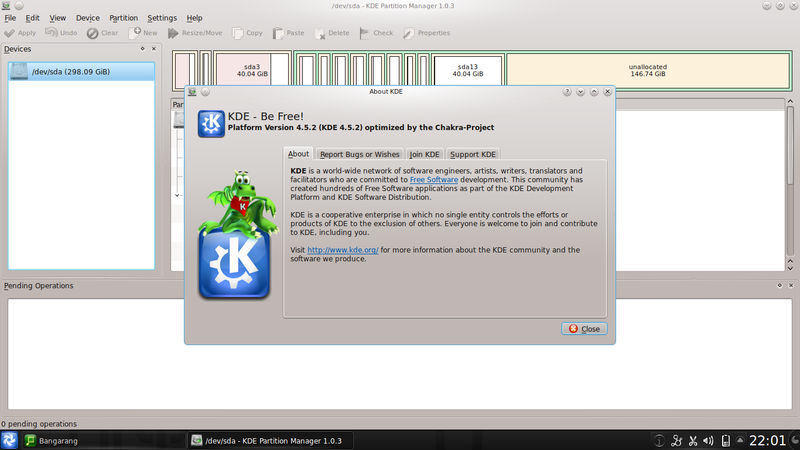 It certainly is a beautiful looking distribution that is KDE-centric with some unique customizations, that also introduces innovative features like the click'n'run bundle installer and its own live scripts. Although these features are not fully developed yet they have a lot of potential and, given enough time, Chakra could really make its mark. After all, it all appeared to work perfectly. The only limitation seems to be the availability of bundles, which can be easily remedied if enough people contribute builds for their favorite programs. For support, there are user friendly links in Konqueror and in the main menu structure (under Chakra) to the web site, for bug submission, to the documentation and to the forum, and most of the extensive Arch Linux documentation and wiki should also apply. The default package selection is decent and pretty much standard for all current KDE distributions, except that it is lacking an office suite. This is a good choice as these take up a lot of space if your aim is to fit on one CD, and with at least three major suites to choose from and the split between Openoffice and LibreOffice allows people to make their own choice. Chakra is still under heavy development and this is not something anybody should install in their office and expect to immediately get productive. So if KDE 4 is your choice of desktop, the Chakra philosophy appeals to you and you don't mind a bit of DIY on top of an otherwise functioning solid base this could be for you. Don't forget, you are already saving time not having to fiddle with the wireless, which is still a major sticking point in many distributions but worked fine here from the beginning, at least for me. Addendum: For some definitive information about the direction Chakra is taking from one of the project leaders please read comment No.4 in the comments section below. It helps to clear a few things up. Thanks very much, Phil! They use their own repositories, so i think its not true that "everything should be available from the Arch repositories and in theory should run in Chakra too". But i'm not 100% sure about this. Thank you. I'm also unsure how much they have deviated from the base but from what I read it seems ok to add from both. 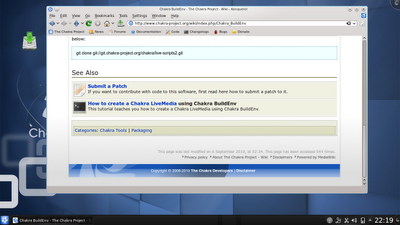 Using the Chakra repositories wherever possible would of course be recommended. Somebody please correct me if that's wrong and Arch repositories are incompatible. Chakra and Arch have not drifted much apart yet, but the chasm is widening everyday. I don't not recommand using Arch's binary repos at all currently they might work but a growing chance they won't. And the 64-bit version does have adobe's 64-bit flash plugin (old) and the beta flashplugin-square . First thx Barnaby for your great review. This is the first we got so far which covers the most features we aim for. Tribe: Tribe has full features to create a new partition-table or even new partitions. You can reformat them or even delete them. LiveScripts2: You can create your own live-media also as DVD and add more apps to it. Some Distros have more space on their discs as we have. Most of the space goes for locales. We have all supported locales added so you have all on livecd available. Also we have the full driver package installed. On overlay we have the proprietary drivers and some extra files which are squashed separately. So no space to add an Office Suite to the livecd but you can install Koffice, LibreOffice or Openoffice with Cinstall. CInstall: is just a test-app. We are working on Shaman2 in the backround. Bundlesystem was also designed to have some nice GTK-Apps available. In 1.0 of Chakra there might be no CInstall anymore. What will Ashoc bring new? Lib32: With Ashoc we introduce lib32 to enhance CCR and 32bin Apps for x86_64 archs. CCR: Is the answer to AUR and is growing fast. Most voted pkgs get added to our binary repositories or ending up as a bundle. Bundlesystem: gets enhanced too. Cinstall has a proper Wizard to click your own bundles. Subsystem: We are now have 2.6.36 series with Xorg19 and newest drivers to support more hardware than ever. Live-Mode: We are enhancing our hardware detections scripts to enable more hardware like wlan-sticks (broadcom) to work also in that mode. Mostly some drivers break other drivers when installed so we have to write some tweaks or enable more cheat-codes in bootmenu. Bootmenu Cheat Codes: You can force to load proprietary drivers or even VESA driver for safeboot. Wiki: also growing fast. We have now 5 translations already. New documentation about our own tools get written. RepoSystem: I recreated our Chroot-System to create our pkgs to have less Chroots installed on your system. Now you can support the whole Branch-Set of the distribution with only one Chroot installed. Team: is growing also. If you want to help us, join. We are open for everybody who knows Archlinux or want's to make Chakra even better. Future: we have lot's of ideas we didn't implemented yet. Akabei for example is our new package manager which will replace pacman completely. It will support xdelta patches so you only download the changes and not the full packages. After that we have split from Archlinux completely. In short: lots to come - lots to see. I tried to run Chakra on VirtualBox, and it kept crashing. I installed as ArchLinux, had the Network as NAT, running the x686 vers. on a AMD Barton 2.8. I got it to boot when I selected the alternate BIOS, but never got networking to work. Using the Chakra repositories wherever possible would of course be recommended.